I've uploaded v12. A lot of bug fixes and polish is included in this update. I also want to fix that bug where loading a map that has invisible water after another map that has invisible water will make that water deep and not kill players. Still have yet to figure that one out. - Removed groundVoid and killFloor config.txt settings. The only easy way I knew how to """fix""" this is to remove the kill floor and groundvoid features entirely. Sad, but there are alternative ways you can achieve this effect. Just make the environment.txt have invisible water and an invisible floor and activate kill water. For the kill floor effect, make the water the studs texture and color it like you would the ground, then simply place your bricks on the water as if it was the ground. It's very easy to do this with the New Duplicator's /cut and /forceplant features. - Updated the old school weaponset modified pack to v2. - Renamed many instances of server.cs files that were in the integrated add-on folders. This will stop the console from complaining about nested add-ons when you try to start a custom gamemode. - Added /votemap (map #), /vm (map #), /rockthevote, /rtv, /currentvote, and /cv commands. This will let standard players change the map. Choose a map with /votemap or /vm and wait for the other players to rock the vote. This can result in the map changing to the one that was voted for in the next round, or if there is enough players voting, an instant load. - Player shape name colors should now finally be the same color as their team, at ALL times. The original methods for doing this weren't working very well. A few half-life 2 songs and doom 1 & 2 songs. - Edited some maps, mostly due to the removal of groundVoid and killFloor. Please redownload them. 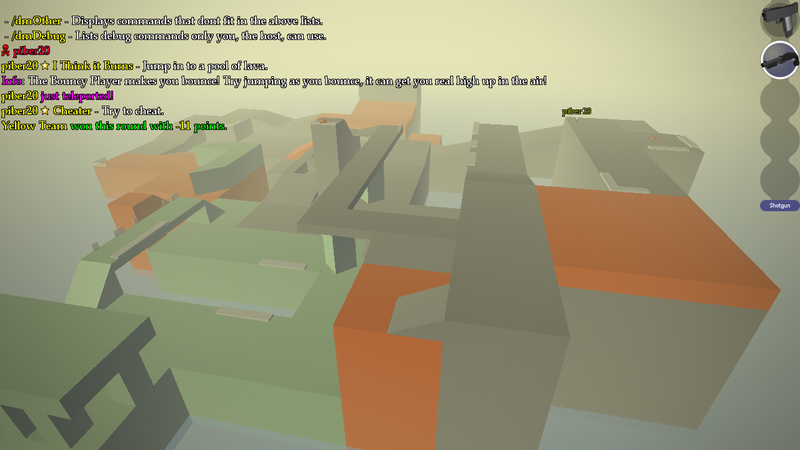 - Added map description feature. Place a description.txt into your maps and it will display the first line into chat. - Support for a "Spooky" theme, in the form of specific music playing like the other themes. No maps use the spooky theme currently though. Would be cool if someone made some more maps for the gamemode. - Upped the default round length to 4 minutes. - Nerfed the Grapple rope. The rope gets longer as time goes on, making hanging from the rope not as viable as a survival tactic as it was before. It's really slow though, so it shouldn't screw too much with grapple related movement tricks. - More I might have forgot. This keeps happening. I dont want to require players to have to download Slayer. I want this to be as plug and play as possible, this is also why I have provided a musicless version. I love how user friendly your team system is and how easy the system makes it to run some really good gamemodes, but for the purposes of this gamemode I feel it would be somewhat excessive and many of your features would go unused. The team "system" I made (if you can classify applying a variable to clients and checking for that variable a system) is meant to be a part of the gamemode, and cannot work for other purposes unless you do direct modifications of the gamemode. It was also a fun opprotunity to practice this programming language. Though in the future if I want to make a unique gamemode I might use your slayer system. Thanks. I believe the gamemode is stable enough to not require an update for quite some time, so I might be working less on this gamemode. If a big problem is discovered though then I will be updating this asap. i've liked to make one-off DM maps for along time and this will be the perfect platform to port some of them over to. Started a poll so I could get an understanding of what would be considered the best map. There aren't really any conventions yet for making maps for this gamemode except the recommendations I provided near the op, so I want to get other people's takes on it. A poll would also allow me to get votes from people who would not want to post. Please vote! I'll also be doing more polls, probably each week, a month seems too long. Also I am doing a few more stuff for v13, so stay tuned. Version 13 is nearing a completed state. It's going to be pretty big. The main new thing that will be introduced is Achievements! The achievements system is based on DarkLight's Script_Achievements, heavily edited to not require players to have a client mod to win and view their achievements. Achievements still show up in the guis of players that DO have the mod, so I haven't scrapped the whole thing, however this revealed a problem with the mod. The gui wont let you scroll past what's in the general category, so if there are more achievements in a category than there are in general, you won't see them. This is worked around by having all the achievements show up in the general category. As with most anything else in the gamemode, the achievements system can be completely disabled if you want. In fact, it's disabled by default to try to keep the feel of a classic deathmatch. Here are some images showing the chat related achievement stuff and also showing off a new map BreadFish has made, which will be released soon. There is also a lot more fixes and much better handling of the code. Stuff has also been added to make it easier for people to create maps. And a whole bunch of other additions/changes, some small, which will be in the next version. It's looking real good! 1000 points feels more realistic. I'm going to take a risk and release v13 now. Be aware that there might be some bugs I didn't catch during development/testing, so please tell me if you find anything that doesn't feel right, no matter how small or how obvious you might think it is. - Added 32 Achievements. My focus on the achievements were less on getting huge numbers (like kill one million players lol!!! or walk 400 miles!!!!!!) and more on special actions/challenges. There are achievements for special moves like performing a backstab with the butterfly knife, running someone over with a vehicle, etc and some fun little achievements like actually using the help command or trying to cheat or use debug commands. There are some quite challenging achievements as well, such as obtaining 1000 points, and getting 666 points within 20 seconds! Any of these achievements are subject to change in any future update so feel free to give me ideas/suggestions for new/changed achievements. - Added host-only debug commands. This is stuff like letting you see the variables related to the round or the map. - The prefs system has been completely overhauled, however this will delete your old DM prefs, and most pref-changing commands have been renamed. - You can disable team-specific spawn points. - You can disable picking music based on the map's theme. - You can restrict the map voting to only change maps at the end of a round. - You can change the tick legnth for tips to show up while ingame. - You can turn off map rotation completely, making all rounds play on the same map unless it is manually changed by votes or admin commands. - Probably more I forgot about. - You can now set up the gamemode to execute up to 5 add-ons. This is meant for expert users, and you must make sure the add-on will work nicely with the gamemode, otherwise things could break. This feature was made for add-ons that add stuff like moderator levels and mute commands. - In addition to the above, NewDuplicator and Fillcan will be executed automatically if you have them. This can be used in combination of disabling map rotation to make it easier to build maps while in the gamemode itself (you would do this by leaving the minigame, by the way). - Added randomised team color settings. You can randomise the colors of EVERY team, give each team a 1/2 chance to be randomised, or give each team a 1/4 chance. - Added pink team. Beautiful. - Changed how and what player stats are saved and shown. Kill:Death ratios are now a thing. Time to get MLG. - Updated Old School Weapons to my current modified version. - Added the Stunt Buggy by Kaje. - Homing Rockets have been rebalanced again. - Added Puller Rope. It's an edit of the grapple rope that is magenta and pulls you to what the rope hits by making the rope shorter over time. 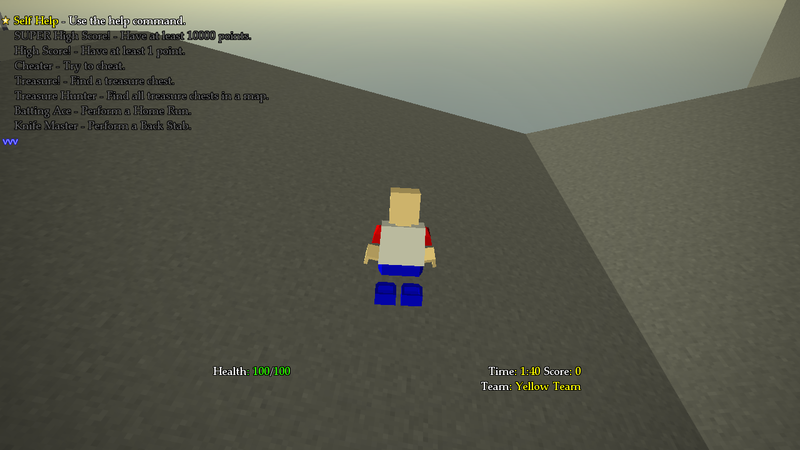 - The bouncy player can now move much faster, has somewhat better air control, and is slightly more bouncy. - The superjump player jumps much more higher. - Added shotgun rays. They are just like normal printer rays like the horse ray, but have the model of the old school shotgun and shoots multiple rays in one go. - Tons and tons of bugfixing and polishing up. The last version was a lot more messy than I thought. - Better handling of musicless version. I tried to add ParagonX9 - Red_13 as suggested by TableSalt but it felt unfitting the more I played ingame. Fallout 2's Vault City song was a possible addition, but ended up being removed. - Many maps have been edited and adjusted for a better experience. Delete the old maps, as some names have been changed. Just dragging the .zips into your addons folder wont overwrite some of the old ones, and may cause problems as a result. A new map was also made by Breadfish, which you will find in the OP. - Tips have been overhauled, and new tips have been added. - As usual there's probably a lot that I forgot to list here, I don't keep a list of changes anywhere. This update is big and there were a lot of internal code changes/fixes/additions to make some of the other changes/fixes/additions possible. The gamemode should be much more stable now. Please tell me of any bugs you may find, or any suggestions/constructive criticism you may have. I think i may make a map for this later. Also, You should add some Payday 2 Music. It would be cool to have more maps with unique themes! There's only 1 ice map, 1 egypt themed map, and it would be cool to see a wild west themed map. Maybe even some space maps, like on a ship or a space station. Go crazy with it! There's also support for a "Spooky" theme, which I have no maps of! Some spooky maps would be awesome. You should add some Payday 2 Music. When playing Gamemodes other than Deathmatch, The Tips still Appear. Why does nobody play this gamemode? It's really fun. Probably forgot to cancel the ticks in the disconnect function. I'll look around to see if I can fix this. In any case, I feel closing and opening blockland after playing any gamemode locally is best practice, as they can keep doing things if you just load another gamemode after. I'm thinking a lot of the people who still play Blockland are not frequent BLFourm readers. I could probably upload this to BLGlass, but it would have to be the musicless version as the creators dont seem to want to allow music any time soon. I also don't know how many people actually use BLGlass regularly, besides not me.